The Israeli airstrike on Syria killed at least 23 fighters, including five Syrian government troops and 18 other allied forces, AFP reported citing the Britain-based Syrian Observatory for Human Rights. The information has not been officially confirmed yet, though, Syrian news agency SANA said, citing the country’s military that the airstrikes had killed three and injured two people, while damaging a number of air defense units. Targets of the Israeli forces have allegedly included weapons storage facilities, logistical sites and intelligence centers utilized by elite Iranian forces in Syria. Israel said that the attack destroyed five Syrian air-defense systems after coming under heavy fire, going on to say that none of its warplanes were hit. "Iran has no military presence in Syria, no bases. Israel is lying. It was Syria that conducted strikes yesterday in response to the repeated attacks on the country. Israel must realize that the situation has changed and aggression would not go unanswered," member of Iranian parliament's commission on security and foreign policy Abolfazl Hassan Beigi said. According to Russian Defense Ministry, 28 Israeli F-15 and F-16 planes were used in the attack, with more than 60 air-to-ground missiles fired over various parts of Syria, half of them downed. "Israel also fired more than 10 tactical ground-to-ground missiles," the ministry said in a statement. 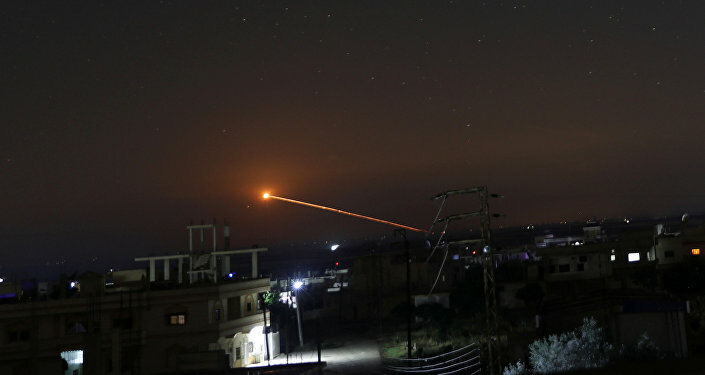 Earlier, the Israel Defense Forces stated that its warplanes had attacked alleged Iranian positions in Syria, firing dozens of rockets onto Syrian territory in response to a purported bombardment of Iranian rockets. According to IDF spokesman Jonathan Conricus, the Israeli military had informed Russia of the planned airstrikes on Syria.